“Is Slow Food Really Slow?” is a series here on Comestibles in which we explore the hypothesis that some of the processes many modern home cooks have declared too time consuming are a lot easier than the admen would have us believe. Everybody panic! It’s the great pumpkin shortage of 2009! I, for one, am deeply suspicious that Nestlé/Libby is making it all up to increase sales. I can report that my local grocery stores have plenty of canned pumpkin on the shelves as I write (the Sunday before Thanksgiving) and my mother, who is providing pie — which is of course the best in the universe — for our gathering, has not called to tell me that she will have to make apple instead this year. We had terrible rain during the growing season here in the northeast, and yet, yesterday at the Farmers’ Market, they had lovely pie pumpkins for sale at $1/pound. How are pumpkin supplies in your area? If you can’t find pumpkin canned or fresh, I would recommend substituting sweet potato or butternut squash, I’ve heard that it’s difficult to tell the difference once the sugar, spices, eggs and cream are added. When a friend of mine recently gave me a sugar pumpkin from her garden, I got excited because I’ve been wanting to try making pie from fresh pumpkin for years and the best type to use is the sugar pumpkin (sometimes called pie pumpkin). If you try this at home, don’t use a Halloween Jack ‘O Lantern type pumpkin. They are not sweet enough and they’re also quite a bit more fibrous. Chop in half and clean out the pumpkin: 15 min. Scoop flesh out of pumpkin: 5 min. Puree pumpkin flesh in food processor: 3 min. So we’ve established that while yes, technically it is slower than opening a can, it’s not as horribly time consuming as you might think. But does the pie taste better? I did not go so far as to make two pies side by side for comparison (I’ll have enough weight to lose after the holidays as it is, okay? ), but going on the memory of the many pies I have eaten which were made with canned pumpkin, I can say that I really didn’t detect any particular difference in flavor. It was delicious! However, I found it very satisfying to make a pie the way my great-grandmother would have, and I didn’t have to add another can to the recycling bin. One thing I did notice is that after roasting, when I pureed the pumpkin it was a very bright orange, not that dull brownish color you find in canned pumpkin. I’m no nutritionist, but I’m guessing there was a lot more beta carotene and other “good for you” compounds in the fresh pumpkin. 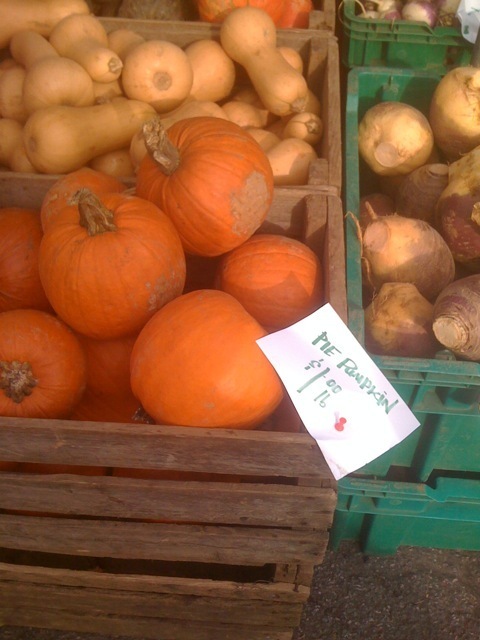 So get thee to a Farmers’ Market and buy some sugar pumpkins. The one I used made the perfect amount of puree for pie (you need about 2 cups of puree for a 9 inch pie). I didn’t measure it but it looked to be about an average size based on what I’ve seen for sale. Ask your farmer, I’m sure she can tell you which size to get. Or better yet, buy two and make pumpkin muffins, or pumpkin bread with the extra. The puree also freezes very well, so don’t worry if you have too much. Cut the pumpkin in half lengthwise and remove the stem. Scoop out the “guts,” saving the seeds if you wish for roasting later. Place the pumpkin halves on a lightly oiled baking sheet, cut side up, and bake until the pumpkin begins to collapse in on itself and the flesh is tender (about 90 minutes). Allow the pumpkin to stand until it is cool enough to handle easily (about 15 minutes). Then scoop the flesh out of the skin and puree in a food processor until smooth. If your puree seems a little watery (mine wasn’t at all, but pumpkins can vary), line a strainer with cheese cloth and set it over a bowl. Cover the bowl with plastic wrap and leave it to drain overnight in the fridge. The final puree will keep in the refrigerator for 2-3 days and freezes very well. If you need a pie recipe, try this one from Simply Recipes, it turned out very well and I especially liked the addition of cardamom to the spice mixture.